Chocolate and peanut butter are a match made in heaven. These Chocolate Peanut Butter Muffins are my go-to muffin recipe. They’re rich, dark, and moist. They are made with oat flour, creamy peanut butter, honey, greek yogurt and coconut sugar. These muffins are simple to make and a family favourite that are as tasty as they are quick to whip up. Preheat oven to 180 degrees, fan bake. Line a muffin tray with cupcake patties or grease with butter or oil. In a large bowl, mix the cacao powder, oat flour, baking soda, baking powder, salt and coconut sugar. In a separate bowl combine the peanut butter, Greek yogurt, and honey. Beat until completely combined. Beat together the wet and dry ingredients and add in the egg. Mix until well combined. Stir in the chocolate chips. Using a tablespoon, scoop out mixture into the muffin tray or cupcake patties. Bake for 18-20 minutes or until a toothpick inserted in the centre comes out clean. To prepare the frosting, heat a saucepan over medium heat and melt the chocolate chips and stir in the cacao powder. 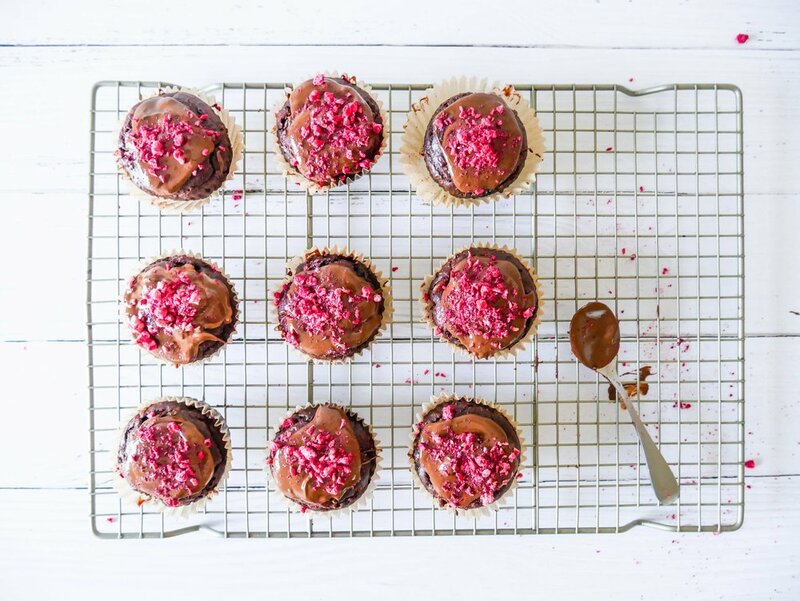 Once the muffins have cooled down, spread the chocolate frosting over each muffins and sprinkle with freeze dried raspberries.